July 19 — Truman’s post-operative energy level has not decreased in the slightest, but he’s being remarkably good about leaving the incision site alone. The couple of times I’ve caught him nosing toward the area, I’ve found that a quick “leave it” will do the trick. He’s such a good boy that way. 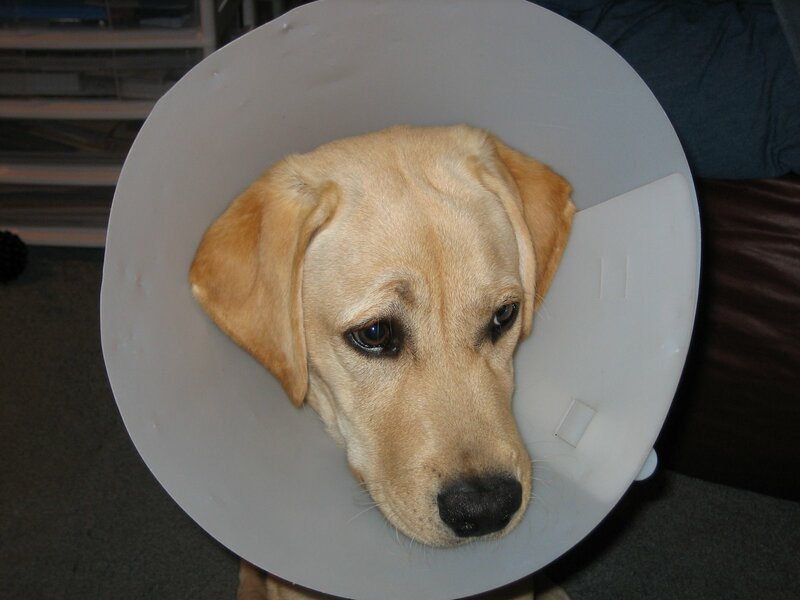 But even the best “good boy” cannot be left to his own devices at night, so we must of course enlist the aid of the dreaded cone. Predictably, he hates it. Who wouldn’t? But after the epic struggle ensues in which I am finally able to hold him still and shove it onto his gigantic head (the struggle to get it off him is far worse, unfortunately, which often sees my vocabulary devolve into three or four choice words and phrases I won’t repeat here), he’s remarkably compliant. He’s still a small enough dog to be able to go inside the kennel with it on and lie down comfortably, and he — unlike poor Lomax — is not afraid to move around while the torturous thing is on his head. Still, he’s not pleased. He merely looks pathetic in this photo. I am for some reason unable to capture his more common expression, wherein he regards me with a hatred like the burning of a thousand white-hot suns. I hate those dreadful collars. We went through heck with Elke banging into everything when she was spayed & had the tumor excised from her foot. Elke didn’t bother her abdomen at all, but the brat found a way to stick her foot inside the cone to get at the stitches! I always feel bad for the dogs when they have to wear the cones. It looks very uncomfortable, but it’s more important that they heal up from surgery or injury. I’ve seen Theo give those murderous looks – not pretty at all.